Abstract: In order to meet the demands of data-hungry applications, modern data storage systems are expected to be increasingly denser. This is a challenging endeavor, and storage engineers are continuously trying to provide novel technologies. However, these new technologies are typically associated with an increase in the number and types of errors, making the goal of securing highly-reliable dense storage devices a tricky challenge. This work focuses on analyzing the errors in addition to providing novel and efficient error-correcting coding schemes that are capable of overcoming the aforementioned challenge. In particular, through informed exploitation of the underlying channel characteristics of the storage device being studied, we provide frameworks for systematically generating error-correcting codes with mathematical guarantees that offer performance improvements in orders of magnitude relative to the prior state-of-the-art. First, we present a technique to predict the performance of codes given the existence of certain error-prone structures in the graph representation of these codes. Next, we introduce a general framework for the code optimization of non-binary graph-based codes, which works for various interesting channels. Afterwards, we derive an approach to design high performance spatially-coupled codes particularly for magnetic recording applications. Finally, we propose a framework to design optimized multi-dimensional spatially-coupled codes. Our frameworks are based on mathematical tools drawn from coding theory and information theory, and rely on advanced mathematical techniques from probability theory, linear algebra, graph theory, combinatorics, and optimization. The proposed frameworks have a vast variety of applications that include both magnetic recording and Flash memory systems. Our frameworks lead to a practical, effective tool for storage engineers to use multi-dimensional storage devices with confidence. 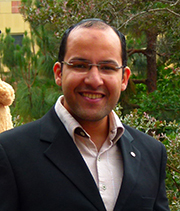 Biography: Ahmed Hareedy is a Ph.D. candidate in the Electrical & Computer Engineering Department at the University of California, Los Angeles. He received his Bachelor and M.S. degrees in Electronics and Communications Engineering from Cairo University in 2006 and 2011, respectively. His research interests are in broadly applying coding/information theoretic concepts and techniques to solve problems associated with modern practical systems, e.g., problems in data storage, distributed computing, DNA analysis, and machine learning. He has industry experience as he worked with Mentor Graphics Corporation between 2006 and 2014. He worked as an error correcting codes architect with Intel Corporation in the summer of 2015 and the summer of 2017. He is a recipient of the Best Paper Award from the IEEE Global Communications Conference (GLOBECOM), 2015 (Selected Areas in Communications, Data Storage Track). In 2017, he won the 2017-2018 Dissertation Year Fellowship at UCLA. In the same year, he won the 2016-2017 Electrical Engineering Henry Samueli Excellence in Teaching Award at UCLA. He is a recipient of the Memorable Paper Award from the Non-Volatile Memories Workshop (NVMW), 2018, in the area of devices, coding, and information theory.